Thallus: crustose, continuous or rimose-areolate or verrucose areolate; prothallus: not visible, or white areoles: flat or verruculose, thin or thick, opaque, ecorticate surface: whitish gray to gray or pale green to greenish white, smooth, epruinose, with an indistinct margin or arachnoid, esorediate Apothecia: sessile, 0.8-3 mm in diam., leca disc: orange-brown or pinkish to carneous, plane or convex, heavily whitish gray pruinose margin: concolorous with thallus, thick, persistent, prominent, entire or flexuose, smooth, entire, without a parathecial ring amphithecium: present, with numerous algal cells, with numerous small crystals which dissolve in K, 70-180 µm thick, corticate or not; cortex: absent or indistinct, hyaline, basally not thickened, interspersed, (45-)75-95(-100) µm thick laterally, (50-)55-80(-105) µm thick basally parathecium: hyaline, containing crystals insoluble in K epihymenium: brown to dark brown, with pigment dissolving in K, with crystals dissolving in K hymenium: hyaline, clear; paraphyses: slightly thickened (up to 2.5 µm wide) apically, not pigmented; subhymenium: hyaline, 15-20 µm thick; hypothecium: hyaline, without oil droplets asci: clavate, 8-spored ascospores: hyaline, simple, ellipsoid or broadly ellipsoid, (9-)12.5-15(-15.5) x (5-)5.5-7.5(-9.5) µm; wall: less than 1 µm thick Pycnidia: not seen Spot tests: K+ yellow or yellow turning red, C-, KC-, P+ orange to red Secondary metabolites: atranorin (major), chlonorine roatranorin (minor), connorstictic acid (minor or absent), conprotocetraric acid (minor or absent), norstictic acid (major or absent), protocetraric acid (major or absent), salazinic acid (minor or absent), stictic acid (minor or absent) and virensic acid (major, minor or absent). Substrate and ecology: on bark mostly of deciduous and evergreen angiosperm trees and conifers in lowland and montane regions World distribution: pantropical, known from Africa, Asia, Australasia, North America, South America, and the Pacific Area Sonoran distribution: Arizona, southern California, Baja California, Baja California Sur, Chihuahua, Sinaloa, and Sonora. 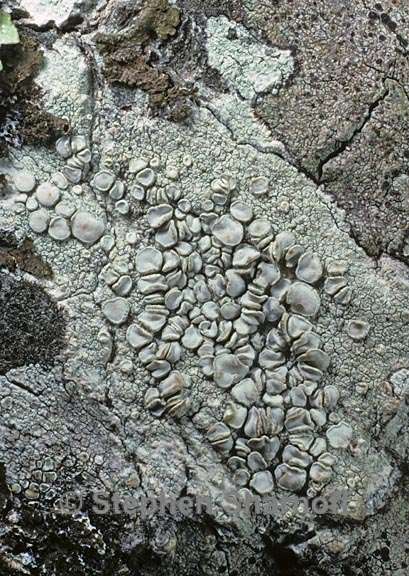 Notes: Lecanora caesiorubella is characterized by rather large apothecia with heavily pruinose disc and thick, flexuose margins. It may be difficult to separate from L. albella. The differences of both species are discussed under L. albella. The chemistry of L. caesiorubella is extremely variable. With regard to the chemistry, Imshaug & Brodo (1966) distinguished five subspecies. Subsequently, the chemical variation was found to be more complex (Lumbsch et al. 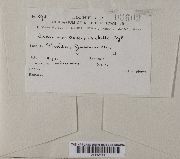 1997) and intermediate specimens were found. Hence, We prefer not to regard the chemical variation at any taxonomic rank. In the greater Sonoran Desert region, the chemotype containing the norstictic and protocetraric acid chemosyndromes in addition to atranorin is most common.